Singer was not one of the dream jobs of Bibi Johnson. The fact that it still came about, was closely related to the realization of a childhood dream and his name was America. The culprit was a seaman who, on a visit to the Johnson family, sparked the wanderlust of Bibi, then four years old, with his descriptions of the supposed wonderland. But first she lived a well-guarded childhood in the Swedish province. Their yearning was given new nourishment when, one day, relatives from America visited the Johnson family and promised that they would be fifteen when they came to America one day. But it was not quite that far yet. The near destination was called Stock-holm, where Bibi wanted to learn the profession of fashion illustrator. 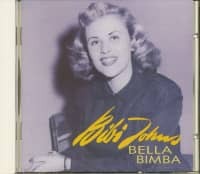 Bibi Johnson's musical talents showed early and were supported by her parents to the best of their knowledge and belief. She received clarinet lessons, among other things. In 1947, shortly before enrolling at a Stockholm art college, Bibi saw in her hometown a revue that was very popular in Sweden at the time, arousing new yearnings in her and letting her first feelers outstretch into show business. After a few weeks, with the help of a friend, she received a recital at the Revue Directorate in Stockholm, and before she knew it, Bibi Johnson was a member of the semester on a tour of Lapland. The parents were less than enthusiastic about it, but Bibi saw the opportunity to earn the money to make their America realm. To a career as a singer did not think yet. Bibi Johnson stayed with the revue for over 18 months, new engagements in jazz and entertainment orchestras in Stockholm followed. 1949 saw the first recordings for His Master Voice - Sweden, u.a. Doris Day's Success Again and How High The Moon. The latter title was also published in the USA. Also Teddy Leyh, program designer at Süddeutscher Rundfunk, had received a Bibi Johnson record from a Swedish friend and subsequently contacted her by letter. When he presented entertainment director Konzel-mann Platte and photos of the young Swedish up-and-coming artist, she engaged Konzelmann as the first soloist of the recently founded by Erwin Lehn entertainment orchestra of the Süddeutscher Rundfunk. Bibi Johnson's debut in Germany took place in May 1951 in Stuttgart. Her debut was so successful that she was again invited to Stuttgart in October 1951 on the occasion of the 'week of light music'. Bibi Johnson on the Gripsholm with $ 280 to America. She only spends a few days at the family and then makes her way to New York. Again, she finds herself quickly in the artistic environment. Gilli Gilli Oxenpfeffer, Katzenellenbogen in Tirol and Bella Bimba: With such songs Bibi Johns, as Gun Birgit Jonsson born two hours drive from Stockholm in Arboga, had single hits in Germany in the fifties. But at night in the bar, also a song title, the Swedish nightingale really started swinging off. She has always been funny - also in her many duets with Bill Ramsey, Peter Alexander, Paul Kuhn, Fred Bertelmann and many others, who are still famous in German hits. A highly talented, comic blonde, camera savvy and photogenic: that's it. Is that it? 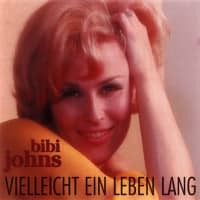 No - Bibi Johns only recorded her best recordings in the sixties and seventies, grandiose ballads like Michel Legrand's I Will Say Goodbye, Musical evergreens like The Sound Of Music by Rodgers and Hammerstein or Irving Berlin's Man sagt Verliebtsein das wäre wunderful, pop songs by Harry Nilsson, Without Him und den Beatles, Eleanor Rigby. She sang her idol Ella and delivered the lyrics for compositions and arrangements by Rob Pronk. Then she produced the film hit Alfie by Burt Bacharach and Hal David as well as the chanson Mon Homme (My Man) from the repertoire of Billie Holiday. Südfunk-Orchesterchef Erwin Lehn composed the swing title Meine Liebe zu dir for her under the pseudonym String. Above all, Bibi Johns loved music, and her companions were almost always musicians. Thomas Keck, the Berlin friend in the fifties, drums at the Spree City Stompers. Pianist Pete Jacques wrote her melodies. Trumpeter Rob Pronk also composed and arranged for them. However, none of the gentlemen ever had the idea to help the great vocalist at her side to a long-playing record. 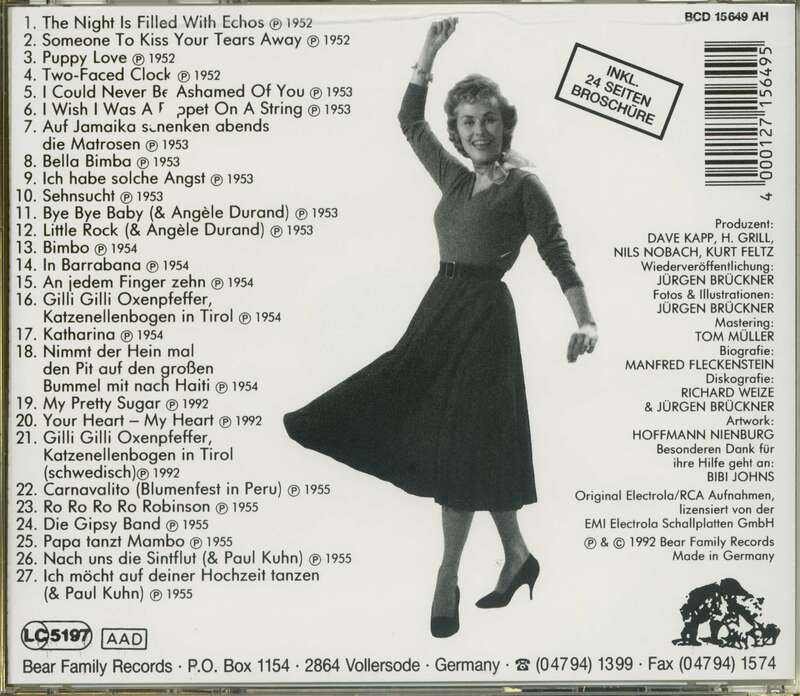 When Kathrin Brigl and I received Bibi Johns for a star talk at the SFB-Stadtwelle 88 8 in March 1996, we were astonished to discover that the German music industry has not allowed this singer a single LP under her name during her almost fifty-year career. Bear Family is making up for this now, with titles that have not become known as hits. The lyricist Bibi Johns would have been discovered. She wrote many songs with a funny feeling for the German language, partly under the pseudonyms Johnny Carlson (with Pete Jacques) and Ina Dosso (with Rob Pronk). Some of them are included in this CD, for example the cabaret, melodically strange He likes it lean. 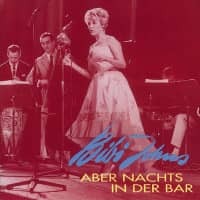 With the titles that Bear Family has presented on the 4 CDs to date, Bibi John has written German pop history and helped to shape the popular music of the fifties and sixties. The cult status she still enjoys today is based on this. The reason why these songs can still be consumed with pleasure is their charm, their immanent swing, their wit. This blonde was funny, but also romantic, sensitive and vulnerable - all qualities she was only allowed to really sing out in these recordings. "Under different production conditions it could have become a kind of streisand," Rob Pronk said in the 88 8 live broadcast in a telephone interview. "Songs I need not be ashamed of," Bibi commented on this selection of music. Listening to her in the radio studio she had tears in her eyes: "Then I really sang really good songs over and over again! She did. For a lifetime. Customer evaluation for "Bella Bimba"